Maybe you think it’s because the sun is out for the first time in – oh I don’t know – a week or so? No, not really. I mean it’s great the sun is shining, birds are chirping. But actually I’m one of those people who really enjoys rainy days. Rainy days mean no pressure to have to do this or do that just because it’s a beautiful day. Rainy days means it’s okay to just hang out and do nothing. So no, it’s not because the sun is out. I’m walking on sunshine because it’s begun – farmers market season! And I think by now you know I love me a good farmers market. And this year’s a little different – new location, new markets to finds, new produce to discover. Oh yeah – I’m walking on sunshine! So it’s the beginning of the season and while the markets aren’t quite yet abundant with produce, the selection is golden. The first treasures of the season are out – morels, ramps, fiddleheads. Fiddle what? Yeah you heard me. Fiddleheads. Not familiar? Oh you should get familiar with this farmers market treasure. 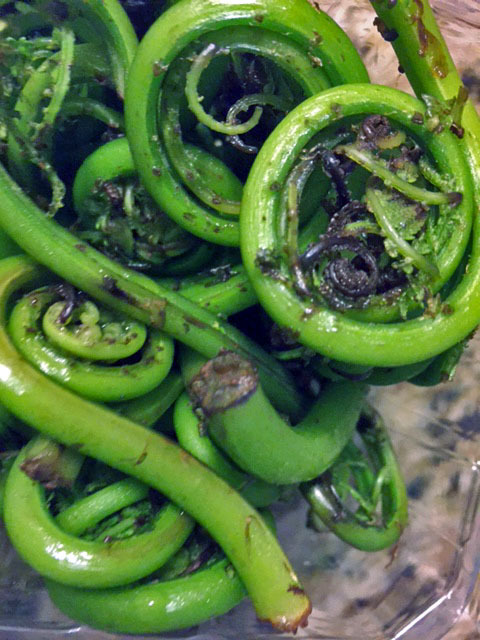 Fiddleheads don’t last for long – they have a very short season – so when you see them you’ve gotta grab them! At first look, fiddleheads may look a bit strange. I get it, they are a little different looking. Fiddleheads aka fiddlehead ferns are just that – they are the coiled fronds off the top of the ostrich fern. When you buy them, you need to clean them real well in a bowl of water and take off any brown papery cover. Then, to ensure they get cooked thoroughly, you want to boil or steam them before hitting the saute pan. Don’t forget this step – if they’re undercooked they can actually make you sick. But please don’t let this stop you! Why? Well, of course they taste great – sort of like a cross between asparagus and green beans. But they’re also a nutrient rich. Just one cup provides about 5 grams of protein, almost three quarters of the RDA for vitamin A and almost half for vitamin C. That’s pretty darn good if you ask me. Hopefully I can take away some of that intimidation with this simple recipe – Fiddlehead Shiitake Saute. So go ahead – hit up your farmers market, grab a bunch and give it a try. Have you ever tried fiddleheads? Once water is boiling add fiddleheads and boil 5 minutes. Meanwhile heat olive oil in saute pan. Once hot, add shallots and garlic. Cook for a minute or two until soft. Add shiitake mushrooms and thyme. Cook for a few minutes until they begin to soften. Add cooked fiddleheads.